In Illinois Republican politics, it’s always the first week of kindergarten. Yes, I know, that’s harsh. But too bad. The terrible condition of the state of Illinois is not the fault of Illinois Democrats, but rather, the fault of both Illinois Republicans and Illinois conservatives who have yet to listen to and heed good political advice. Here’s the gist of it: stop nominating and electing the wrong people, and stop allowing mediocrities and wrongly motivated people to run the party. Illinois didn’t get to where it is today by accident, and things didn’t happen here without constant warning. Governors Jim Thompson, Jim Edgar, and George Ryan. General Assembly GOP caucus leaders James “Pate” Philip, Lee Daniels, Frank Watson, Christine Radogno, Tom Cross, and Cross’ replacement Jim Durkin — who looks like he will continue the tradition of failed leadership. Party chairmen Gary MacDougal, Judy Baar Topinka, Andy McKenna, and Pat Brady. Former U.S. Senator Peter Fitzgerald could’ve done more before he bailed, and current U.S. Senator Mark Kirk is a better fit for the Democratic Party. Probably the biggest — lost opportunity — over the past few decades was the eight-year tenure of Illinois’ own U.S. House Speaker Dennis Hastert. For at least the past dozen years Illinois Republicans, conservatives especially, have been warned about their continued Stockholm Syndrome-like support of lousy leaders. Not all were equally foolish and destructive, but every single person named above either left — or is in the process of leaving — the Republican Party worse off than when they took power. If you want to learn more about the details — and let me warn you it’s not a pretty picture — peruse the archives of this website and RepublicanNewsWatch.com. Next Tuesday Illinois elects its governor. As noted in many articles linked here, both candidates will do damage to the state. Only one of them, however, will damage the party that can be the vehicle for cleaning up the mess. The guy who will damage the Illinois Republican party is Republican Bruce Rauner. It’s one thing for there to be disagreement inside a coalition. It’s quite another for people like those named above — to be openly and actively hostile to the party’s base. 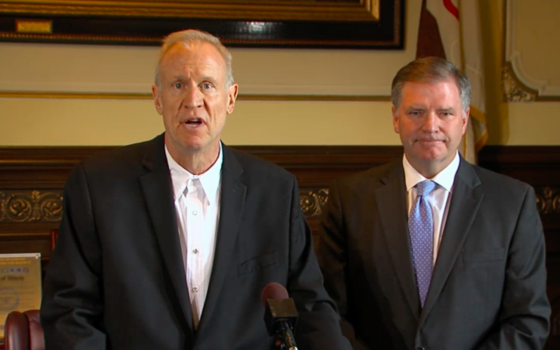 Rauner and his team are cut from the same cloth. Forget unity. They want a party in their own image with social conservatives expunged. The Illinois Family Institute’s Laurie Higgins has outlined in easy to understand language what is at stake next Tuesday, and I’ve attempted to teach the same as best I can. I’d encourage you to read and re-read these articles. “It can’t get any worse” many are saying. “We must defeat Pat Quinn, they say, or the state of Illinois will go bankrupt.” First, things here will get worse no matter who wins, and second, you don’t have any idea how bad things can get if there continues to be no competently-led Republican Party to recruit and sell solutions with candidates of good character. I am also aware that many friends disagree with me. I wouldn’t be a friend, however, if I failed to warn yet again that as with all those people listed above, you’re supporting the wrong horse. A reader sent me a note asking how the Miss America contest can field 50 talented and attractive women and the Illinois Republican Party can’t nominate a talented and attractive candidate for governor. The reason is because the culture of the Illinois Republican Party is rotten to the core, and its leaders over the past few decades have been horrendous. Most good people want nothing to do with a party that demonstrates incompetence year after year. The only way that will change is if there is a thorough housecleaning. I can’t imagine how voters can think that someone with Rauner’s questionable track record (see the upcoming links) would clean house. The truth is, Rauner is several degrees worse than all the rest of our previous IL GOP leaders. If you need even more evidence for the case I’m making, review the articles chronicling this disastrous Rauner candidacy at Republican News Watch. I have compiled some of the posts written by Laurie Higgins found in the comments section beneath her own articles. They are well worth your time. They can be found starting here: Laurie Higgins Takes Republicans to School about Bruce Rauner. What’s next as Sun-Times/Rauner story explodes?